Welcome back! 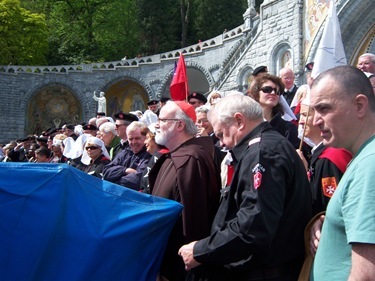 I have spent most of the week in Lourdes, France, accompanying the Order of Malta in its Annual International Pilgrimage to the Marian shrine. 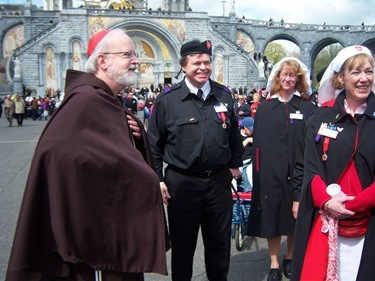 This year, Father Jonathan Gaspar, Father Kevin O’Leary and Father Dan Magni were all there accompanying the Order of Malta’s group from Boston and the infirm people that they take. I try to accompany them every other year. Father Dan’s parish school in Lowell is St. Jeanne d’Arc. He thought the children would get a kick out of this photo. 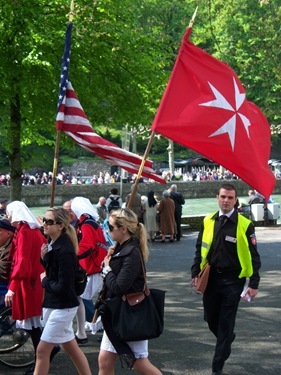 We flew from Boston to Paris and changed planes to go to the city of Pau. 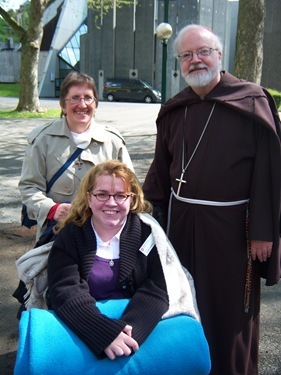 There, Joe Feitelberg met us and drove us to Lourdes. 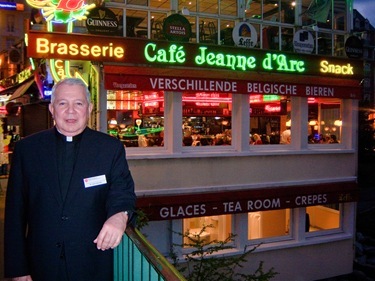 When we arrived in Lourdes, there was a luncheon with some of the Boston group, then I rested a little bit. In the evening we had the candlelight procession, which was very beautiful. The procession, as always, had thousands of people holding candles around the plaza and in front of the basilica. 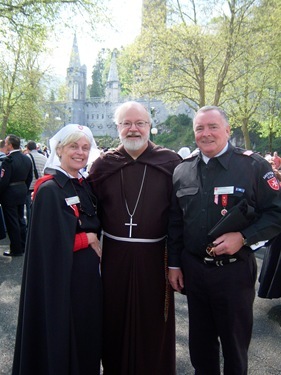 There, I met a priest and a seminarian who had come to Lourdes from Andorra, which is a small mountainous country in the Pyrenees on the border of France and Spain. The priest told me that he was one of only 12 priests in Andorra and that the bishop is also the prince of Andorra! He said there were 80,000 Catholics there. 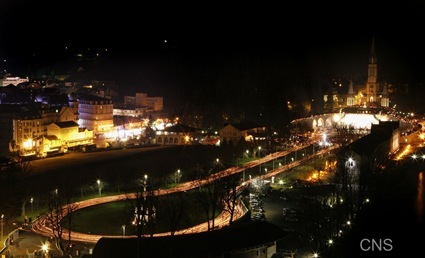 I had never met anyone from Andorra and I told him I had always wanted to go there. At the end of the procession they asked me to do the blessing and final prayers. They prayed the various mysteries of the rosary and sang the Lourdes Hymn as well as other hymns. Then, Saturday morning was the Mass at the Grotto, where 151 years ago St. Bernadette had 18 visions of the Blessed Mother. I preached at the Mass and the whole American group was there. I think there were around 400 people in the American group. We were very blessed to have good weather while we were there. Ordinarily, Msgr. 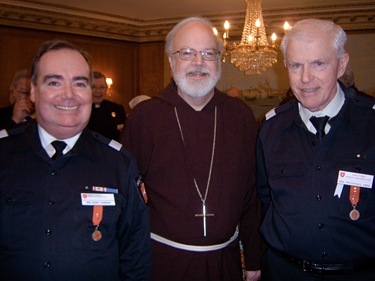 Dennis Sheehan goes with us as one of the main chaplains of the Knights of Malta, but this year he was having First Communions at Our Lady Help of Christians in Newton and was unable to join us. In the Church of St. Mary’s in Charlestown there is a wonderful mural that depicts the Blessed Mother receiving Holy Communion from the hand of St. John the Apostle, the beloved disciple. I am sure that Mary often received communion from St. John. After John received the legacy from the Cross – “Behold your Mother” – John took Mary into his home. From there, Mother was a source of guidance and inspiration to John and the first disciples. When Jesus was arrested, St. Peter took out his machete to defend the Lord, but was only able to whack off the ear of a servant and then ran for his life. He denies Jesus to a waitress with an attitude, then Peter tried to do what we all do at times – that is to follow Jesus at a safe distance … but when the rooster crowed, he went out and wept bitterly. Peter’s great transformation takes place on Pentecost where Peter and John and the others persevering in prayer with Mary are filled with the Holy Spirit. The frequent contact of Peter with Mary helps Peter to follow Jesus ever closer and to fulfill his vocation: to follow Jesus not at a safe distance, but up close. Mary is still involved in the life of Jesus’ family helping us to be better disciples, more faithful to Jesus’ Gospel, more aware of His loving presence in our lives. One hundred and fifty years ago, a fourteen-year-old peasant girl received a special grace while praying in this very place. Mary the Mother of Jesus appeared to her. There were 18 visions of the Virgin. Bernadette Soubirous was coached by her pastor to ask the woman’s name. Mary replies in the dialect of the region: “I am the Immaculate Conception.” Four years before these apparitions, Pope Pius IX had defined the dogma of the Immaculate Conception, that means that Mary had received the singular grace to be conceived without the stain of original sin. This belief about Mary has its origins in the early Church, but it took centuries to be able to develop a philosophical and theological explanation. I am happy to report that Duns Scotus the Franciscan trumped Dominican Thomas Aquinas in coming up with a theological explanation of this ancient dogma. It is like the Red Sox beating the Yankees. Some people question why the Church had bothered to define these Marian Doctrines like the Immaculate Conception and the Assumption of Mary. It would be more ecumenical to downplay these teachings. These dogmas however, help us to understand other articles of faith and to understand our own destiny. These dogmas speak to us about the Church’s teachings on grace and redemption, the Church’s teachings on the dignity of the human body and the resurrection that flows from a life of grace. Most Catholics confuse the doctrine of the Virgin Birth of Christ and the Immaculate Conception of Mary. I like to explain Mary’s Immaculate Conception as her mystical baptism that preserved her from sin, and it was done on a credit card, paid later by Jesus’ death and resurrection. The Scriptures tell us Mary is full of grace. That grace and her faith make her Christ’s first disciple, and the new Eve, the new Mother of a redeemed humanity. To me it is very significant that on this spot where Mary reveals herself as the Immaculate Conception, she makes a spring of fresh water appear, water like the Pool of Siloam with curative powers. I believe there is a message in this for all of us. Sin is the fatal disease which leads to eternal death. In our baptism we are graced and made to be disciples of Jesus Christ. The curative waters of baptism incorporated us into Christ’s family, the Church. The processions and pilgrimages that Mary asked for in the apparitions are to give us all the opportunity to renew the grace of baptism, to experience the solidarity of our membership in the Church and to express our faith by our love and concern for the sick and the suffering. Mary identifies herself by her Immaculate Conception: that miracle of God’s love that preserved her from sin and prepared her for her vocation as Mother of the Redeemer. Today in this holy place, our God asks us, “Who are you?”. Let our answer parallel that of Mary who said, “I am the Immaculate Conception.” Let us reply that our deepest identity is, “I am a baptized Catholic.” The waters of my baptism were, for me, the Jordan, the Red Sea and the water flowing from Christ’s wounded side. In my room in Boston, I have a picture of the person who baptized me, Father Jerry Reidy, my uncle. Where would we be without baptism? But, it is not enough to say: “I am a baptized Catholic.” We must live the costly grace of discipleship. The great German Pastor Bonhoeffer often reflected on what he called cheap grace and costly grace. Cheap grace is the grace we bestow on ourselves: the preaching of forgiveness without requiring repentance, communion without confession, grace without the Cross. Cheap grace is an illusion. Costly grace is the treasure hidden in the field, for the sake of which a person will gladly sell all that he has. It is a pearl of great price for which the merchant sells all his goods to acquire. It is the Kingdom of God for whose sake a man will pluck out his eye that causes him to stumble. It is the call of Jesus Christ at which the disciple leaves his nets and follows Him. Costly grace is to go the extra mile, turn the other cheek, give our cloak along with our tunic to the one who asks. Mary is the woman full of grace, full of costly grace. The Gospel prophesizes, “all generations will call me blessed.” Indeed, the beatitudes are Jesus’ description of His Mother, poor in spirit, meek, pure of heart, thirsty for holiness and justice. 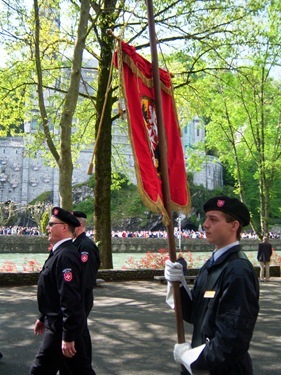 Here in Lourdes, Mary gathers us as her children, brothers and sisters to each other and disciples of the Risen Lord. 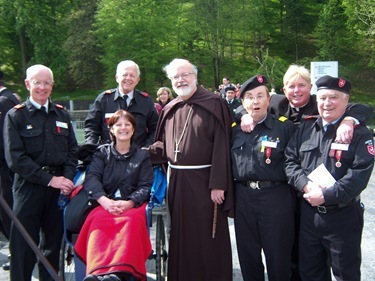 After being pilgrims here at Lourdes we will return to our communities with a clearer sense of our calling, the gift of our Baptism, the gift of our faith. After the Mass we had a meeting with the Grand Master of the Order of Malta, Fra Matthew Festing. He distributed medals to the sick from our group. On Sunday I celebrated Mass with thousands of people in the lower basilica, the basilica of St. Pius X. I’m not sure how many people it holds, maybe 10,000 or 20,000, but it was packed! I celebrated the Mass in Latin and gave the sermon in French and English. The readings and music were done in many different languages, as well. There were many bishops who concelebrated on Sunday, as well as many priests. 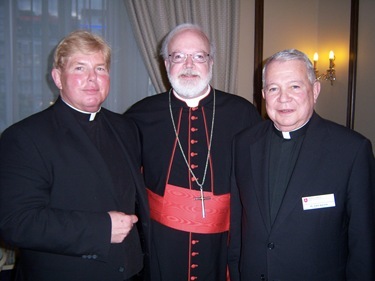 As far as American bishops that were with us, there was Bishop of Trenton, Mort Smith; Bishop Frank Rodimer, the former Bishop of Paterson; and Bishop William Curlin the former Bishop of Charlotte. The Boston group was quite large. 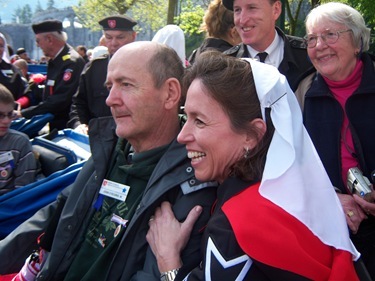 Among them were many good friends like Jim and Anne O’Connor; Joe and Sheila Feitelberg; Gus Grace; Nancy Gibson; Sue Downing; and, of course, Hap and Sue Redgate, who were the pilgrimage chairs. I spent Monday as a day of recollection and prayer for myself, and visited several churches. Then we departed to arrive back in Boston on Wednesday. 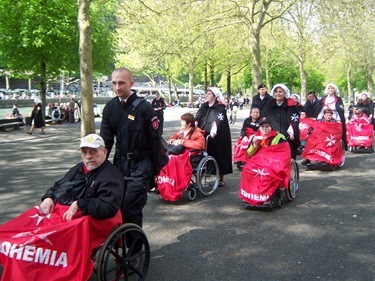 One of the most moving aspects of Lourdes is always the centrality of the sick pilgrims who are there. I’m sure that many go with the hope of a physical healing; but, even more importantly, I think that the large numbers of people who flock there are looking for spiritual strength and solidarity. There are certainly many conversions there, as well. 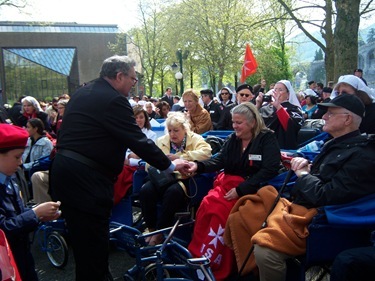 Certainly, the care given to the sick in Lourdes is something that is very inspiring and edifying. Many people who were with us were very seriously ill with cancer and life-threatening kinds of illnesses. Compared to other Marian shrines, it has the greatest emphasis on that compassion and service to the sick, and bringing them into contact with God’s loving mercy and healing power. Since we had traveled all night we had not celebrated Mass, the day that we arrived they let us say Mass in a chapel in the basilica. The chapel’s walls were completely covered with ex-votos — votive offerings — of people thanking the Blessed Mother for graces received. The sacrament of reconciliation is also one of the many important activities of the shrine where many, many confessors are always hearing confessions in every language imaginable. It is such a popular place of pilgrimage! 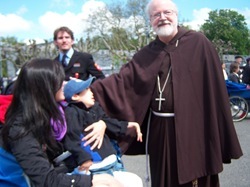 It is interesting that in these days, when Mass participation has dropped off, the numbers of people visiting the pilgrimage sites throughout the world have increased. 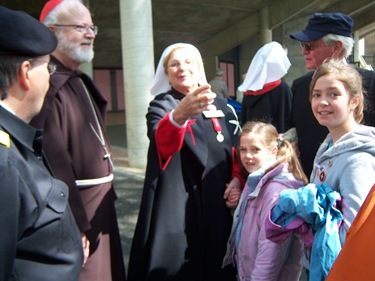 It shows that people still have a hunger for God and that so many of the people coming to the shrine are not just the active Catholics or the members of the Order of Malta and others like them, but all kinds of people really seeking God.